After so many gray days it's great to have bright sunny weather where I don't have to wonder how to compensate for dull light and haze in my photographs. Mullens always looks best with a high tide so I went out this morning hoping I could get some good photos of the shorebirds that have recently returned. Unfortunately most of the birds were roosting on the far side of the bay and I only got a good look at them when something over there frightened them and they all flew up. However, after circling overhead a couple of times they settled down over there again. The only birds on my side of the bay were Red-capped Plovers (Charadrius ruficapillus). These birds are here all year but I never get tired of watching and photographing them. They are so tiny and so curious and will often come closer to watch me while I am watching them! I was focusing in on the male on the right hand side of the photo but when I looked at the photo I realized I had also photographed a female on the left hand side of the photo - even though she is a little out of focus. This male came closer as I stood still watching him and eventually walked right past me. 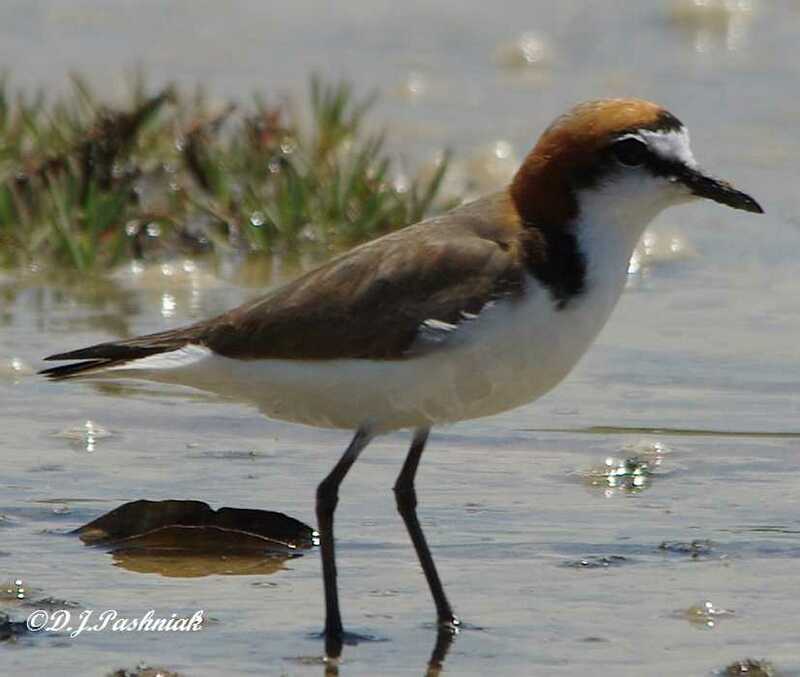 Often other birds are less wary when they see the Red-capped Plovers running around quite close to me. This morning there were two Red-necked Stint (Calidris ruficollis) which were also walking through the shallow water. I don't know if these birds have stayed here all winter or if they have just arrived from the northern hemisphere. Today was bright and sunny, which was lucky as it was the day for the QWSG shorebird count and I have to kayak over to the site I count. I saw two Little Egrets roosting in mangrove trees. 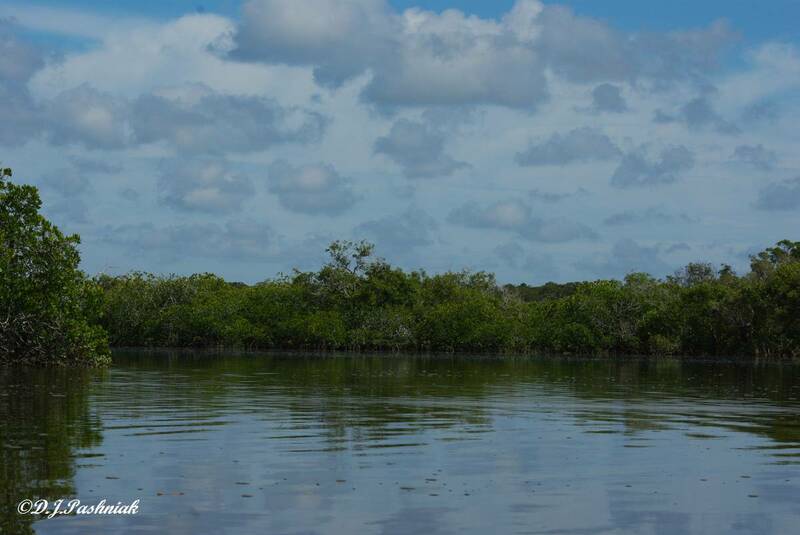 They prefer mangroves with open branches low down so they can sit and watch for whatever might be coming. This one let me kayak quite close without moving at all. There were quite large flocks of Eastern Curlew, Whimbrel, and Godwits on the sandbank that the birds use on tide heights like this morning. 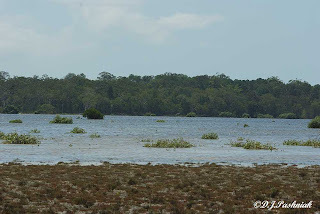 There is a lot of vegetation on the sandbank so the birds are not easy to see. When I focused in on the Godwits I also saw a flock of smaller birds - Great Knot. I have not seen flocks of Great Knots on this roost before so I am wondering if this is just a flock passing through on their way to somewhere south of here. It will be interesting to see if they are there next time I go over to the roost in a couple of weeks time. 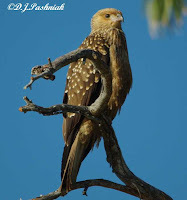 For more bird photos visit the Birds Photography Weekly. 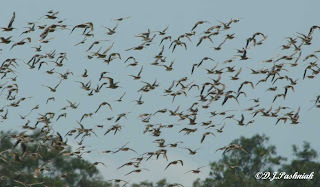 I know the huge flocks of migratory shorebirds are back but the problem is how to see them properly! The week has been gray and damp! We had one day when the rain gauge for the day showed 75mm (3 inches). The rest of the time it has either been light drizzle or a howling gale. There's certainly no chance to get out in a kayak. The weather bureau is predicting similar weather until next week sometime. These photos were taken out at Inskip Point. No post processing done at all - I wouldn't want to give an unrealistic picture of conditions! The first is high tide with the roosting birds visible as a hazy gray line. The second is low tide with only a few terns visible out on the sand island. At least the wind was enjoyable for someone! I counted seven of these kite surfers zipping back and forth. 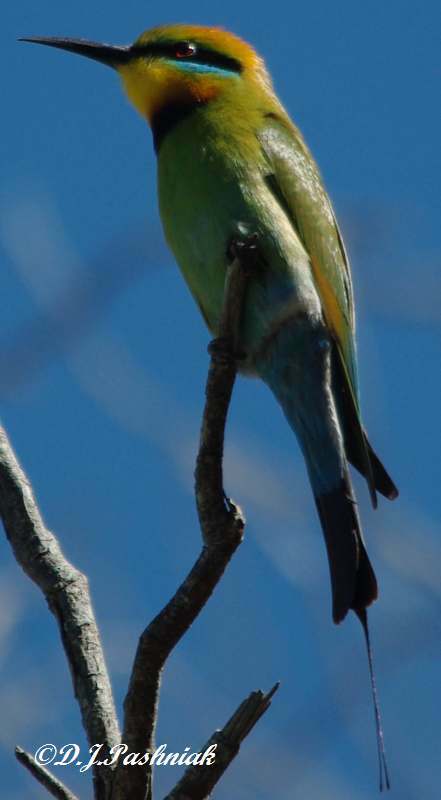 I often see Rainbow Bee-eaters (Merops ornatus) when I am out at Inskip. 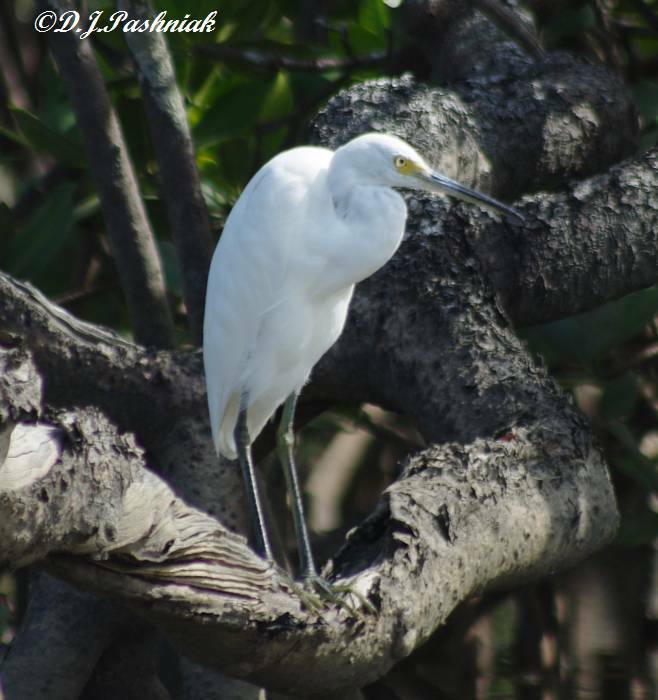 These photos were taken in different amounts of light and shade and the plumage seemed to take on different colors. All photos enlarge when clicked on. I always enjoy an early morning walk along the bayside. 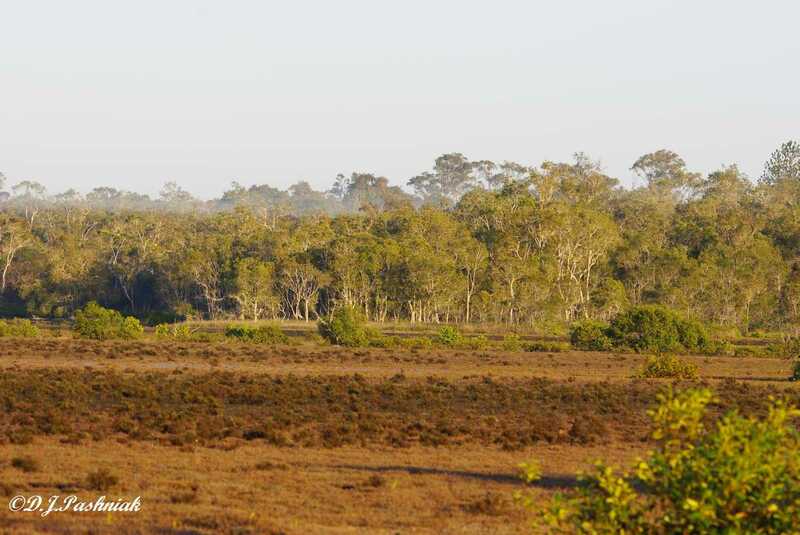 Yesterday, I walked up to the saltmarsh area where the mist was still curling around the trees on the far side. 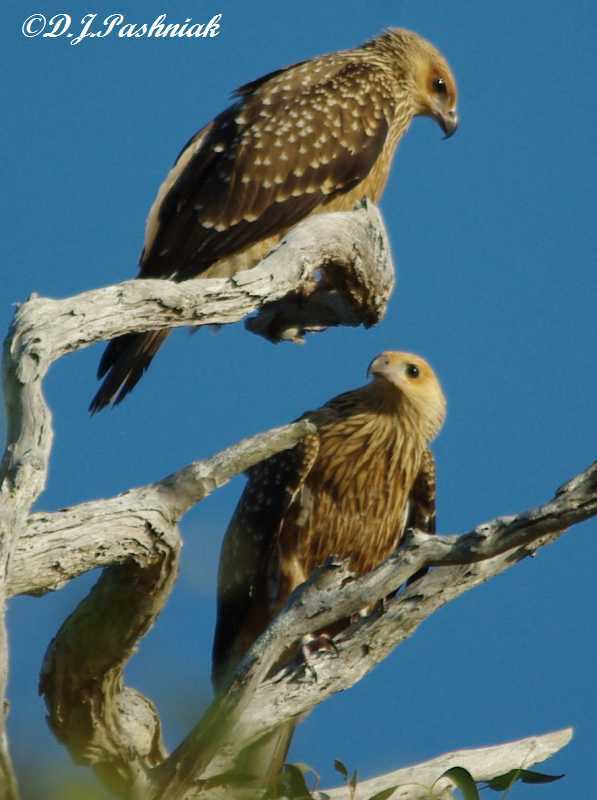 Although I could hear birds up in the trees none were down close enough for photos until I was almost back at the picnic area when I saw two Whistling Kites sitting in a tree. One was high up on a bare branch and the other was almost hidden in the tree leaves. The one in among the leaves flew off to another tree close by and let me get good views there. Then a very aggressive Spangled Drongo scolded and hassled the birds until both flew a little further off and sat together in the top of another tree. Both birds are juveniles showing the typical pale spots down the back and heavier streaks down the front. 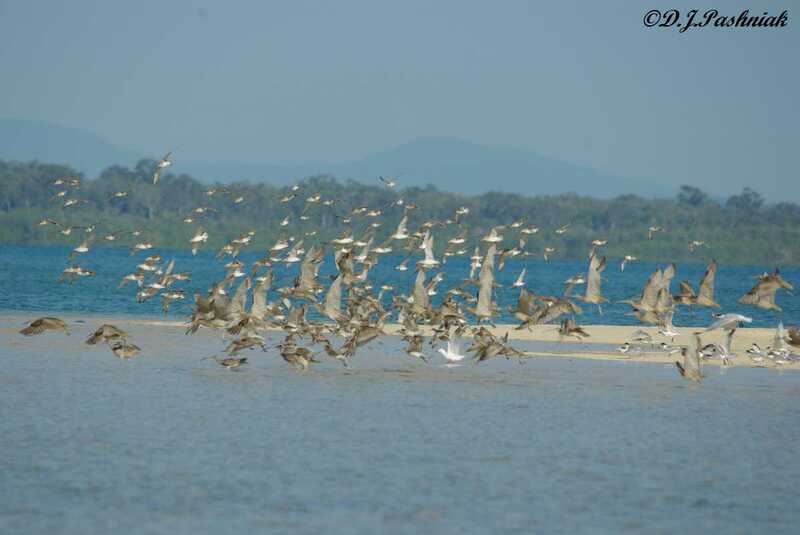 When I went out to Inskip Point last Thursday morning there were still no large flocks of returning migrant shorebirds. However, there were small numbers of shorebirds that would definitely be interesting to photograph. The birds were having a hard time. 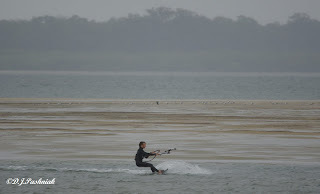 First there were fishermen very close in to the sand island and all the birds flew up in alarm from there. 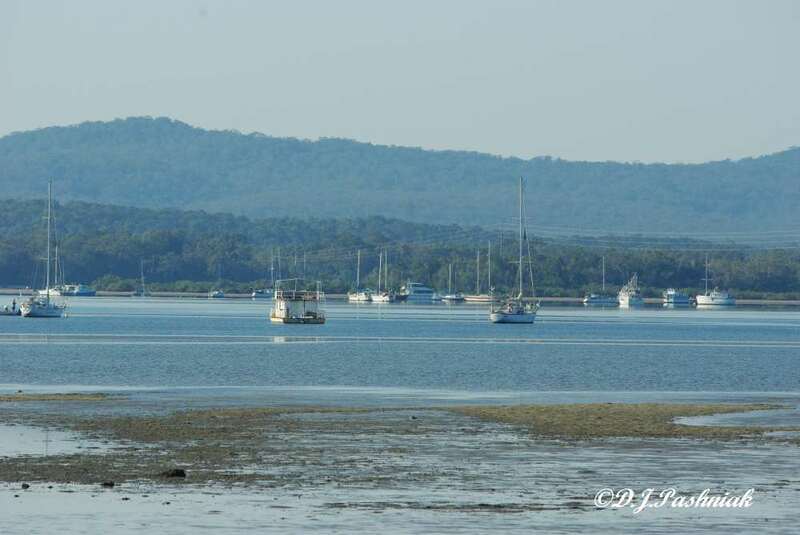 Some of them came in and roosted on the end of the point where the traffic drives out to take the car ferry to Fraser island. 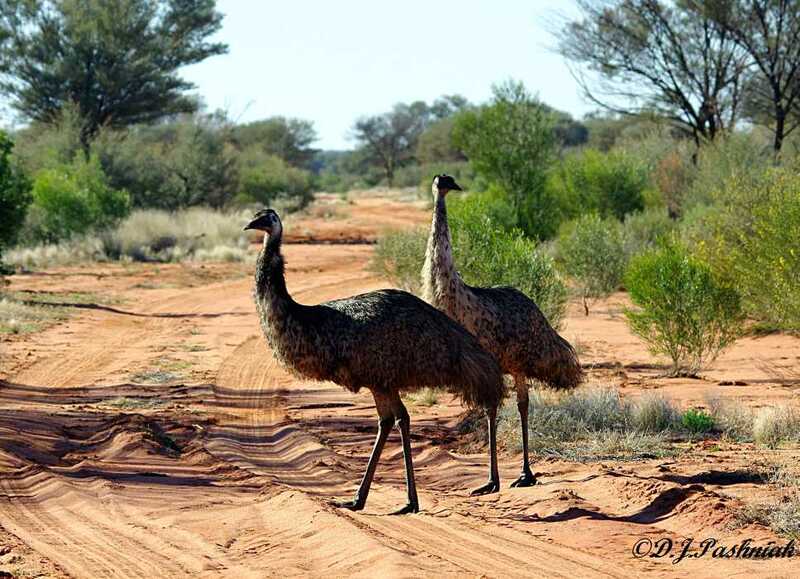 However, once again they were sent flying by a tourist vehicle that decided it wanted to stop right in among the roosting birds! This was the result! All photos enlarge when clicked on. Some of the birds eventually settled down again on the sand. Most were Crested Terns but sheltering in behind them was a small flock of mixed shorebirds that I decided would definitely be interesting to photograph. I first sorted out which were Bar-tailed Godwits and tried to see if there were any still showing signs of breeding plumage - which would definitely indicate they were returning migrants. 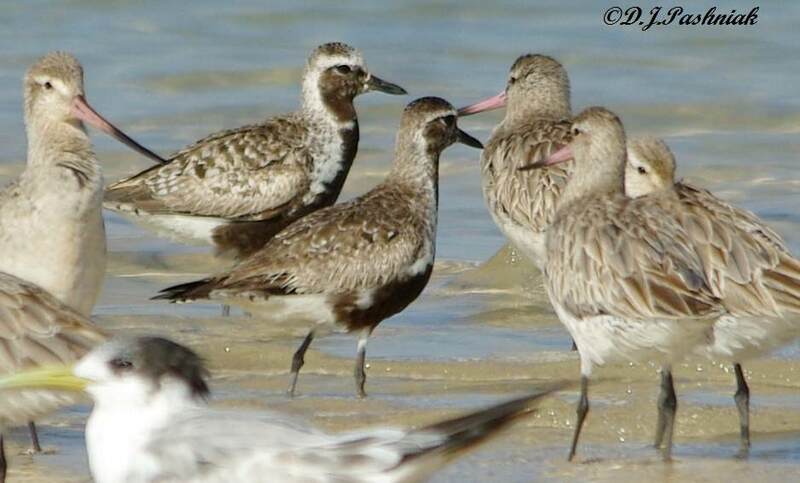 Even the Godwits present some challenges for ID when there is often a huge difference in size between the large females and the much smaller males. 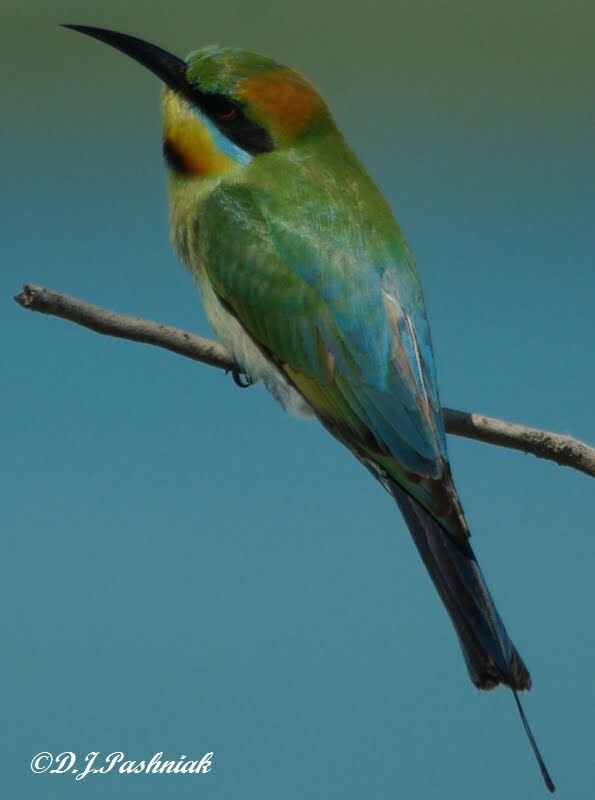 The females also have a much longer bill than the males. 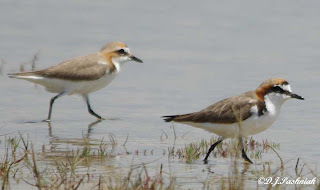 The next birds that caught my eye were Plovers still in almost full breeding plumage. I focused in on them and tried to get good photos for ID. At first I thought I was looking at Pacific Golden Plovers - which are the most common of the Plovers around here. 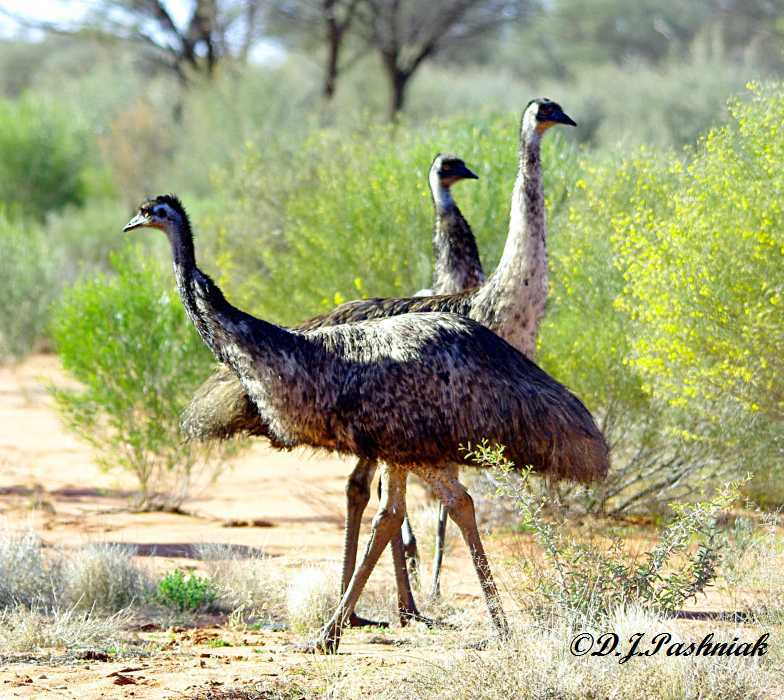 However, these ones did not have any hint of gold about the plumage and the edges of the feathers were white tipped instead of cream/buff. Also they looked considerably bigger standing next to the Godwits. I realized these were Grey Plovers (Pluvialis squatarola). 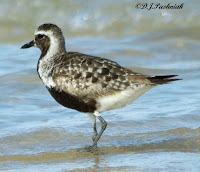 We never see Grey Plovers further up the bay. 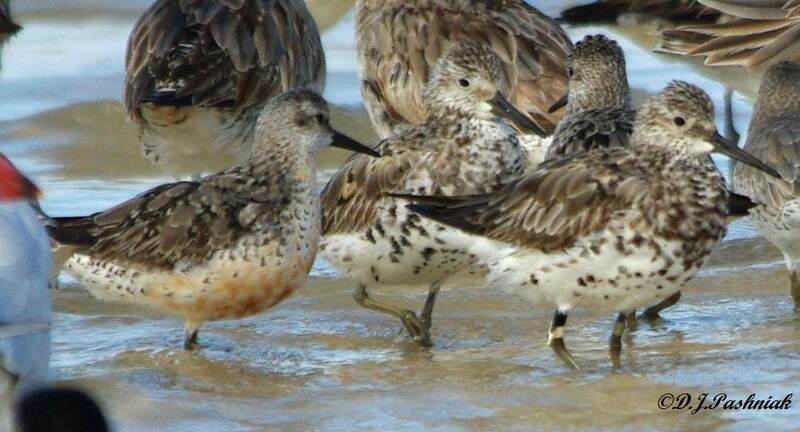 There were still smaller birds to ID and these looked like Great Knot (Calidris tenuirostris). However, looking closer I also saw a Red Knot (Calidris canutus). 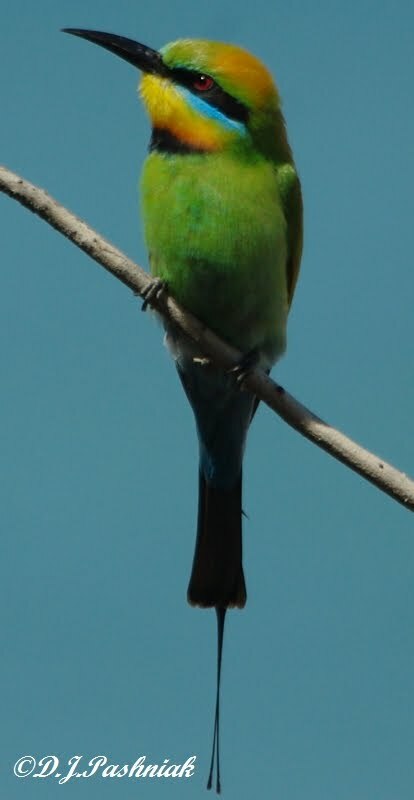 This bird is easy to ID when it has some of the red breeding color still showing! 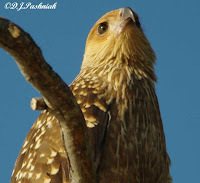 Also it is a slightly smaller bird and its bill is shorter. 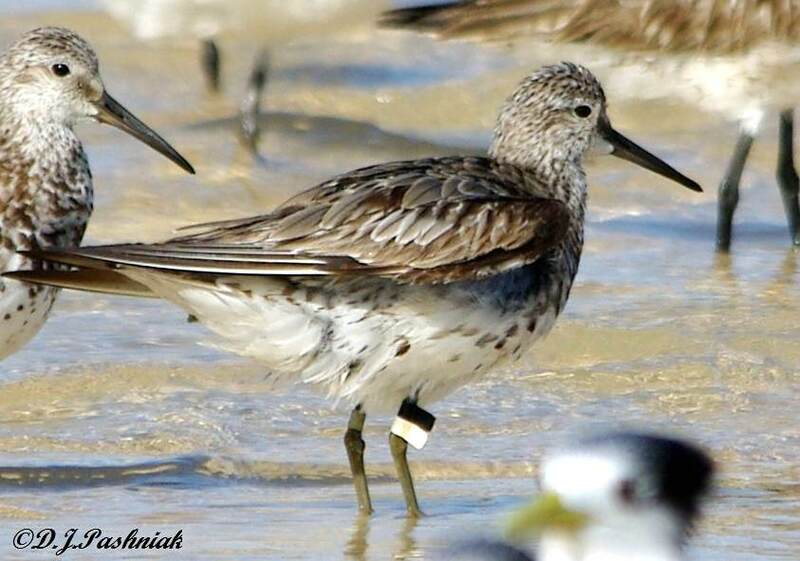 One of the Great Knot had flags on its right leg and a metal band on its left. I have sent off details of this bird and hope to hear back eventually just where it was flagged and banded. 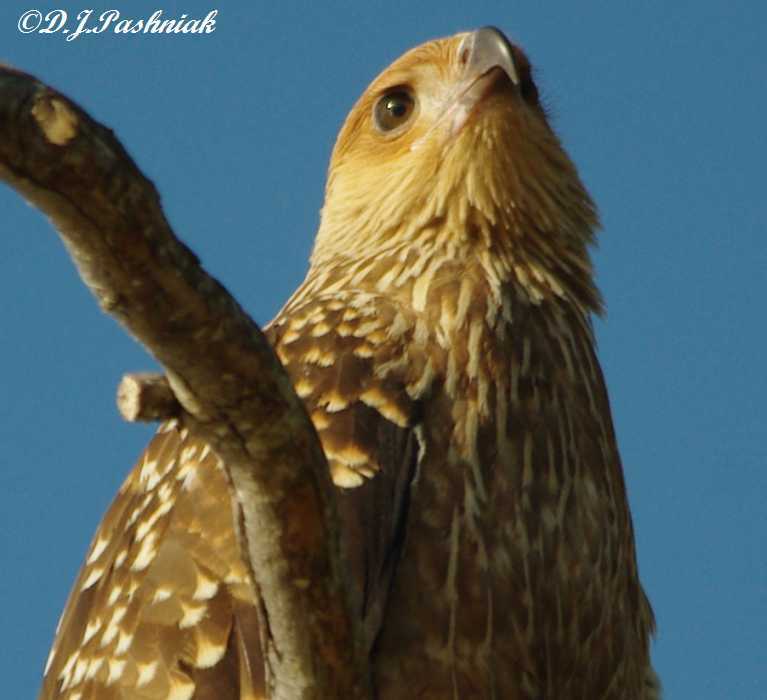 For more bird photos visit the Bird Photography Weekly. Yesterday morning I went out to Inskip to see if there were any Godwits back yet, but I couldn't seen any. 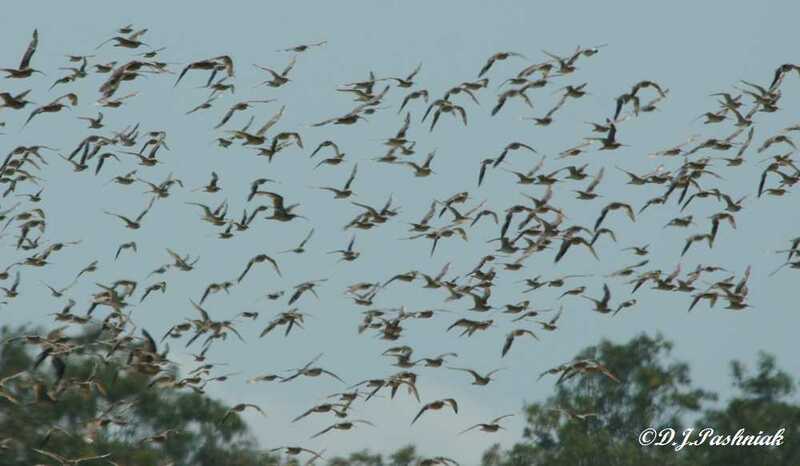 When they return there are huge flocks of them. Last year I first saw them on the 10th September so there are still a few days to go - that is if the recent winds have not delayed them. However, there were large numbers of Eastern Curlews roosting out on the sand island. I was surprised to see two small flocks of Double-banded Plovers still here (30-40 birds I estimate.) I have read over the last week or so that these birds have already left from other places along the east coast. 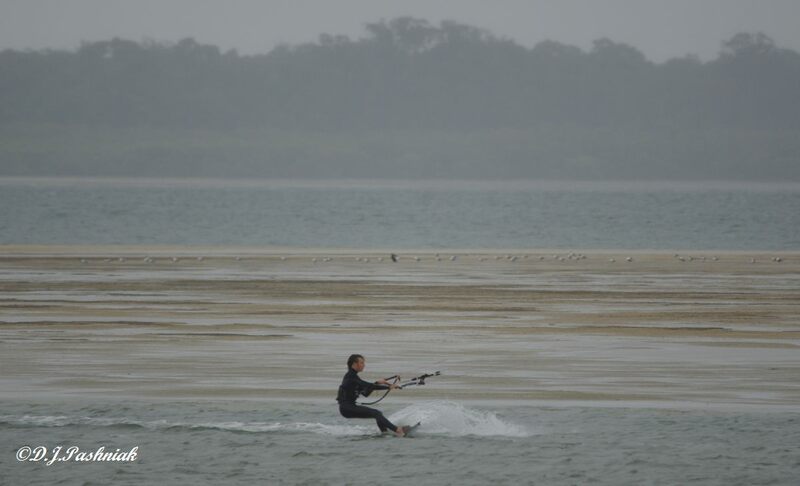 As usual the birds were sitting down in the wheel tracks left by vehicles driving out to take the barges over to Fraser Island. Even though I was looking for birds on the sand I didn't see them until some of them flew off and over to the sand island. 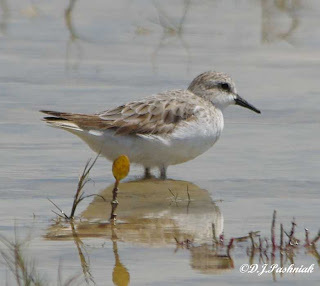 I saw birds in full breeding plumage and others still with smudgy color on the bands. They all looked extra fat - ready for their migration to New Zealand. 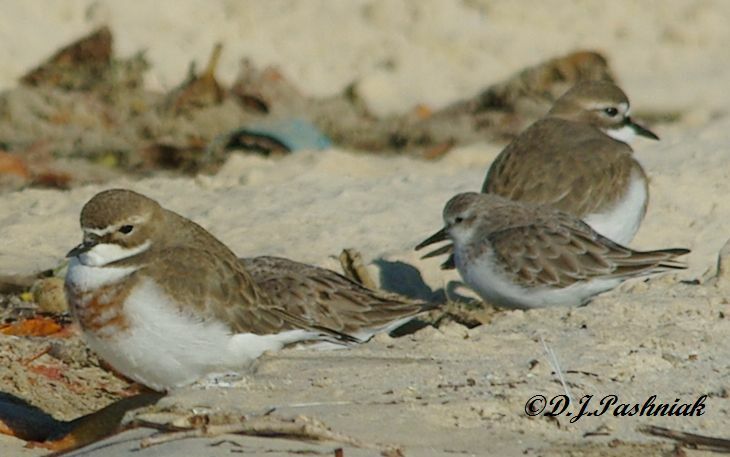 There were also a number of Red-necked Stints roosting with them. Just off the point there were a number of dolphins rolling lazily in the swell. They didn't seem to be going anywhere and stayed in the same area for some time. I didn't manage to get photos of them right out of the water - only managed some of their fins as they moved deeper into the water. This photo seems to be of an adult and a much smaller juvenile and I am told that there are possibly two young ones with this pod at the present time. 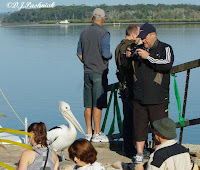 I went around to the Dolphin center at Tin Can Bay this morning to see if there were any pelicans there. 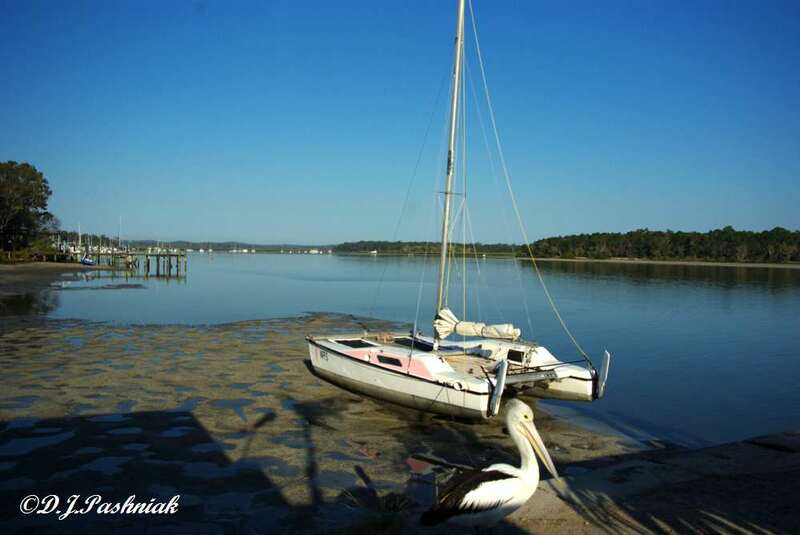 All the birds seem to know that they will get a free feed if they are there at the right time so there are usually pelicans and cormorants around. 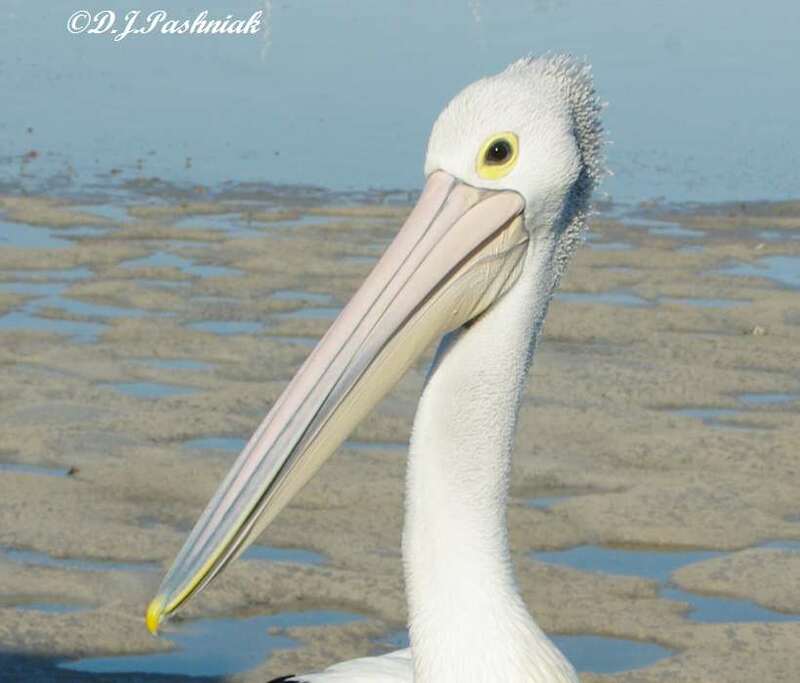 However, there have been few pelicans recently. 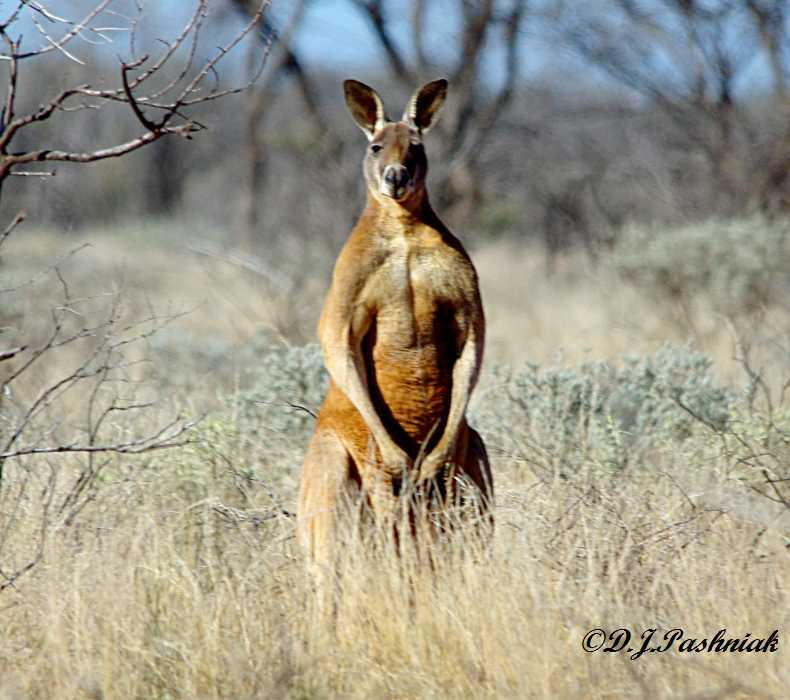 Maybe most are still inland where they are breeding and raising their young. 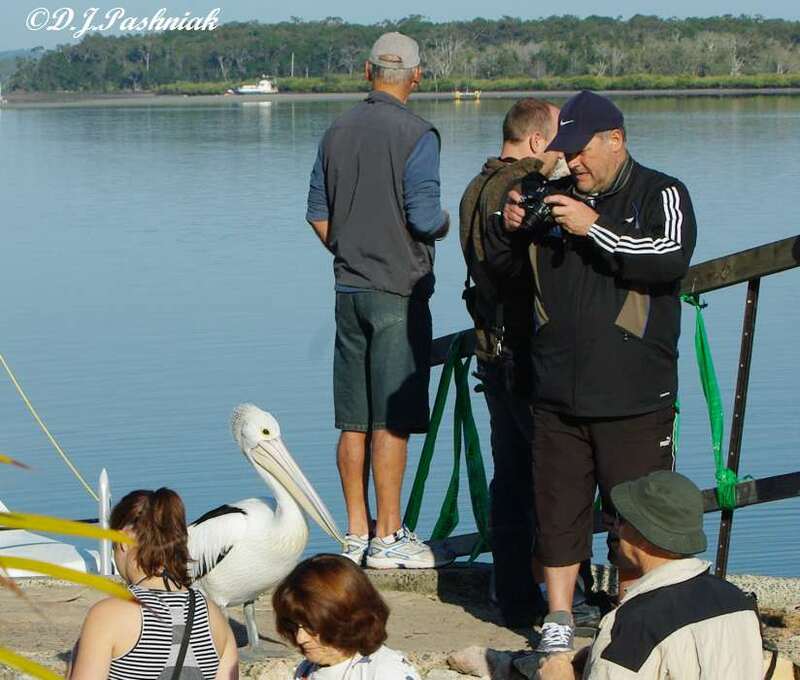 The only pelican there this morning was a 'regular' that the staff have dubbed "Nigel". He doesn't mind having his photo taken. Or being part of any photo for that matter. (Looking up Snapper Creek.) 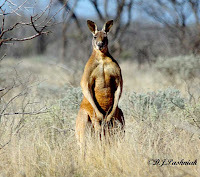 If the action is too slow then he walks slowly right in among the tourists. Someone might have some food! 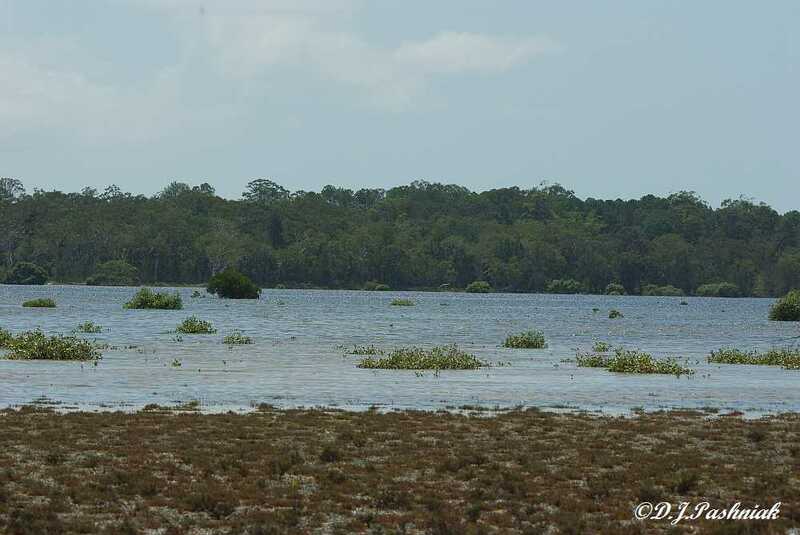 This photo was taken looking south along the bay towards Crab Creek.